Betty Jane (Lutz) Charles, 93, of Lancaster, went to be with her Lord on Saturday, February 24, 2018. She was born in Lancaster to the late Harry B. and Marie Catherine (Feld) Lutz and was the youngest of 4 children; the late Jean Marie Lutz, the late Dorothy McKinsey, and Harry Lutz. Betty lived in Lancaster her whole life. She attended James Buchanan and J.P. McCaskey schools. 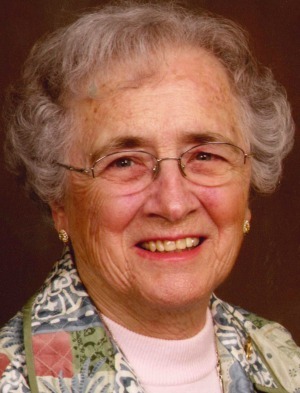 In 1944, she graduated from Lancaster General Hospital as a Registered Nurse. In 1946 she married Eugene W. Charles, who died in 1999. Together they had two children, William (Lois Ann) and Barbara Charles. Surviving are three grandchildren, Lauren, Ann, and Rebecca. Working various private duty assignments, Betty worked at Lancaster General Hospital and also as a School Nurse for Lancaster Township Schools. She was a member of Redeemer Lutheran Church and formerly of Grace Lutheran Church, both in Lancaster. Betty was a former Red Cross, Lancaster General Hospital, and Homestead Village volunteer and enjoyed needlework and reading. Spending her last years at Homestead Village, Betty developed friendships with fellow residents and staff, and had a fondness for the nurses. A Memorial Service will be held Thursday, March 1, 2018 at the Glasford Room at Homestead Village, 1800 Village Circle, Lancaster, PA 17603 at 2:00 PM. Interment will be private at the convenience of the family. In lieu of flowers, memorial contributions may be made to the Homestead Village Employee Appreciation Fund or to Hospice of Lancaster County, 685 Good Drive, Lancaster, PA 17604. We would like to express our deepest sympathy. May all your good memories out weigh your sadness during this difficult time. I am a volunteer at Homestead Village and met your mother Betty, in the Ladies group doing crafts. I only knew her about nine months but always enjoyed spending time with her. I liked her personality and sense of humor with residents and caregivers. I am sorry for your loss. She lived a full life and is finally reunited with her Mother. She always wanted to go see her Mother and missed her so. I hope you find peace in your memories of her and know she is no longer suffering. My sincere sympathies. She will be missed by everyone.